ABOVE: Lionel LeMoine FitzGerald as a young man. Opening reception on Thursday 11 October, 3-5 p.m. This exhibition re-visited the life and work of Manitoba artist Lionel LeMoine FitzGerald (1890-1956). Organized by Professor Marilyn Baker, art historian at the University of Manitoba School of Art, FitzGerald in Context set the artefacts of FitzGerald's life alongside significant works of art from the National Gallery of Canada, the Winnipeg Art Gallery, and University of Manitoba collections. 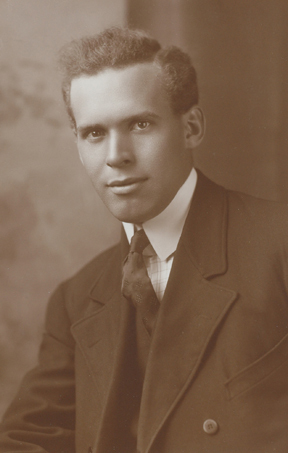 Relying extensively on unique documents from the FitzGerald Study Collection at Gallery One One One, Professor Baker contextualized FitzGerald's family history and friendships. Through a combination of major paintings by FitzGerald and his colleagues, and rarely seen prints, drawings, and personal memorabilia, Professor Baker charted the life of this important Winnipeg artist and teacher. Her ground-breaking research showcased for the first time FitzGerald's experimentation with photography. Gallery One One One gratefully acknowledges the support of the Government of Manitoba, Department of Culture, Heritage, and Tourism, and School of Art staff and volunteers. Special thanks to Dianne Scoles, Kim Nguyen, Vanessa Stuardo, Seth Woodyard, Chantal MacIntyre-Muir, the late Virginia Berry, the Hudson's Bay Company Archives, the Archives of Manitoba, the University of Manitoba Archives & Special Collections, the Winnipeg Art Gallery and the National Gallery of Canada, Ottawa. Regular Gallery One One One Hours: Noon to 4:00 p.m., closed weekends. Admission is free. The FitzGerald Building is located at the University of Manitoba's Fort Garry Campus next to the University Centre. Parking is available in the Parkade behind FitzGerald Building, and at meter and ticket dispenser lots. Parking is free after 4:30 p.m. and on weekends. Campus map link.